We're heading off a little late for our holiday vacation. We'll be back in January! Have a wonder winter holiday and a great 2010! A lot of money is floating around with no where to grow. People are disillusioned by the stock market by paper assets and many conventional ways of investing. Thinking about real estate but not sure what city to invest in or where to get the most bang for your investment buck? Check out REIN's Top Ten Canadian Towns to invest in. Based on thousands of hours of research learn where, why and when to invest in real estate. We've used this information for the past 8 years to improve our investing strategies and bring our joint venture investors returns of 100% on their initial investment! It's worth it! Click here to get your copy. Since Imperial Oil Ltd. and Suncor Energy Inc. have given the green light to previously shelved projects employment in Alberta is looking to pick up in 2010. It won't be the crazed hiring when there was a labour shortage but there will be jobs for skilled individuals. What this means is that more highly skilled workers will be coming to Alberta to get jobs. 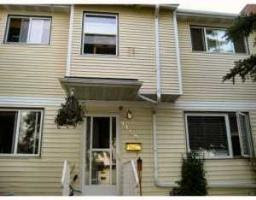 They will subsequently be looking for a place to rent or live. For landlords that means houses to be rented or houses to be sold. Battle for the oilsands - "Across Alberta, companies have spent years developing new technologies that promise cheaper, greener production. In the next few months, some will move from the lab to the field in critical tests that could radically reshape the industry. Hamilton: Alberta has wind at its back - "Alberta could even launch its own feed-in tariff program and unleash the innovation that has been demonstrated in the oil patch, and it could use slightly increased royalties from the patch to fund the program. The Stelmach government keeps talking about jobs and the need to preserve economic growth, but clearly there are just as many – probably a lot more – jobs to be created by fanning the flames of a green-energy movement than in keeping a handful of dirty coal plants open. Alberta ranchers have plenty of livestock manure that can be converted into electricity. The province is graced with ideal geology for geothermal power production, and it already has the expertise required to drill deep wells that can tap heat within the earth. The Canadian Geothermal Energy Association says low-hanging geothermal fruit in Alberta would produce 500 megawatts, but more investigation of the resource would likely reveal that much more is available." Edmonton recognized in Copenhagen for climate leadership - "The City of Edmonton received an award for climate leadership Wednesday in Copenhagen.The award is in recognition of the city's Carbon Dioxide Reduction Edmonton (CO2RE) program as well as its new renewable energy task force.Edmonton was selected, along with four other Canadian cities, by 10 environmental organizations. The other designated cities are Calgary, Toronto, Montreal and Vancouver. Provincial winners are British Columbia, Manitoba, Quebec, Nova Scotia and Ontario.City officials are honoured by the award, saying they hope it highlights some of the good things going on in Canada, as opposed to all the negative attention the country's lack of climate-change efforts have received so far in Copenhagen." Alberta Puts Billions Into The Coffers Of Canada's Oilsands Bashers - Follow the money. It's the oldest rule in journalism.It usually explains the virtuous rhetoric that sometimes emanates from the mouths of politicians and lobbyists. You dress up crass self-interest in the garb of some lofty cause, and bingo! You've got a nice shiny message to sell.READ MORE HERE. It's Simple Economies: Alberta Finance Minister Iris Evans - The province spent more than it made. That was the simple message delivered by Alberta Finance and Enterprise Minister Iris Evans during the Wetaskiwin & District Chamber of Commerce's Nov. 30 luncheon. She pointed out that Alberta is not in as bad of shape compared to other provinces. "They have to borrow money to keep Ontario afloat. One hundred and eighty-four million worth of debt – that is what Ontario has got," said Evans. GRAB THIS ARTICLE. OTTAWA — Canada's economy swelled by 79,000 jobs last month, much better than many economists had expected, as the number of people with full-time and part-time jobs increased in November while the number of self-employed fell. FOLLOW THIS STORY. Top 5 Tips To Improve Your Concentration - When TV newscaster Diane Sawyer was asked the secret to her success, she said, "I think the one lesson I've learned is there is no substitute for paying attention. "Are you thinking, "I agree, but HOW do we improve our ability to focus and maintain attention -- no matter what?" A few days ago the temperature dropped so low that you could've thrown Kool-Aid out the window and made popsicles before it hit the ground. Edmonton was the coldest place in North America and the second chilliest in the world. Geez, is this what I'm going back home to? At least it'll be a white Christmas if the Reindeer don't freeze before they make their landing on the 25th. With Christmas but a few weeks away, this will be our last newsletter for 2009. You'll receive your next issue after the holidays on January 15th, 2010. Snuggle up with a Warm Wool Blanket these holidays and connect with family and friends. Wishing you and your family a wonderful Holiday Season and the warmth, joy and success of a truly great 2010 ahead. Thank you for this wonderful year. We appreciate all your calls, emails, thoughts and comments. You are a joy to know and work with. Our offices will be closed from December 24th to January 5th for holidays. We're looking forward to catching up with you again in the New Year! This is from Peter Kinch's email newsletter. Well, as expected, The Bank of Canada held steady on their rates last week, keeping the historically low Prime rate unchanged at 2.25%. Now given that these are so-called emergency rates, it is just a matter of time before they start to rise. On the line with me is best-selling author and Mortgage Expert, Peter Kinch with Dominion Lending; Pete, what advice do you have for Canadian families faced with the inevitability of higher rates in the future? Well Russ, everyone should start budgeting for an increase in rates. You know, it's a well documented fact that the Bank of Canada is using these low interest rates to kick-start the economy and their goal is to get inflation back up to 2% but as soon as they feel that they are at or near that level, rates will definitely start to rise. It's not a matter of if, but when. So if I'm a consumer right now either thinking of buying a house or a home owner possibly looking to renew my mortgage, what should I be considering in the New Year? You will have increased the amount of money that is applied directly to your principal balance, so that when the time does come that your mortgage is up for renewal and the rates are higher, you'll be renewing with a lower principal balance and as such, your payments may not change much. Increasing your payments today will allow you to adjust your current budget so that you will not experience 'payment shock' a year or two from now when the inevitability of renewing into a higher rate actually happens. Thanks Pete, some good advice to follow. In the Business Centre, I'm Russell Byth. My best friend came to Japan for a week to visit. She found T. Harv Eker's Millionaire Mind book on my shelf and managed to read it TWICE before going back to Canada. That is how compelling this book is. Anyway T. Harv Eker has a blog that is a must read. The excerpt below talks about our money programming. I remember as a child always hearing that "money doesn't grow on trees" which is true to a point however it does grow on shrubs though! The secret is all in perspective. "Our financial blueprints consist mainly of the “programming” we received in the past, especially as children. We aren’t born knowing anything about money; we were “taught” primarily through our family upbringing, but also through multiple cultural influences. We take this conditioning and run on it for the rest of our lives, even though we may not be aware of it. If a phrase like “Rich people can’t be spiritual” is ingrained into you, that subconscious, negative connotation will override actions any day, even if being rich is what you really want. We’re primarily creatures who act on emotion more than we act on reason, even though we’d like to believe the opposite." Wow! Time has flown this year. Can you believe that it will be 2010 in less than 2 weeks? Do you remember 1999 when the whole world was worried about Y2K? Many people stayed home with gasoline, water and food just in case civilization ended. Now we are looking back and chuckling about that one. I assume we'll be shaking our heads at Global Warming pretty soon too. What was the most important thing of the last decade for you? Has anything special happened in your life? I’ve spent the whole decade in Japan. I’ve had too much fun to go home! It’s been a great experience that has shaped my life incredibly. Here is a quick list of some major inventions/advances in 1900-1910 and 2000-2010. In the Olympics of investing Alberta is still the gold medalist. The province got a score of 8.5 out of 10 in The Provincial Investment Climate Index. This index has seven main components: corporate income tax, fiscal prudence, personal income tax, transportation infrastructure, corporate capital tax, labour market regulation, and burden of regulation. "Alberta came in first place on most indicators including corporate income taxes, corporate capital taxes, personal income taxes, fiscal prudence, and labour-market regulation. However, Alberta ranked seventh on transportation infrastructure, which assesses highways, urban transit, air, rail, and marine service." The article states that Alberta is losing ground to other provinces. Saskatchewan comes in at 6.6 and British Columbia at 6. Those two provinces saw a year over year increase of 0.7 and 0.2 certainly they are improving but still no where near Alberta's stellar 8.5 performance. See the smallest apartment in New York city. At $150,000 it still costs as much as an ok condo in Edmonton, but apparently micro studios are the way to go now. That says a lot about Manhattans affordability. However, I can definitely see the benefit of owning your home (however humble it may be) outright in 2 years. If we all went smaller there would certainly be a lot less credit and cash flow problems. So this couple has made a lifestyle choice that is both beneficial to the wallet and financial future. This was forwarded from a REIN member. This is the Greatest Christmas decoration ever! If you listen to any type of self-improvement, self-help or success mastery courses you must of heard of Jim Rohn. He was one of the "grandaddies" of them all. Anyway he passed away this weekend. He was an invaluable teacher. This video is very important for Canadian expats whose children are born overseas. 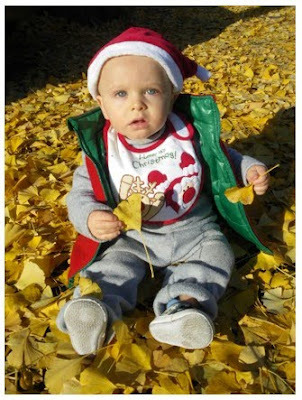 My son was born in Japan he automatically is granted Canadian citizenship, however if he has a child outside of Canada they will not be granted Canadian citizenship. It doesn't seem right to limit Canadian expats' children's ability to gain citizenship. I may be mistaken but Canada needs to meet a set amount of immigration every year to keep our economy healthy. Why should Canadian citizens or their children be denied citizenship? According to a Nu Wire Investor article that's the plan for those with more than $800,000 to invest. "The prospect of strong returns in bargain real estate is driving interest, especially among the wealthiest, who are predicted to boost allocations in property to 30 percent — with portfolios of over 50 percent property holdings not uncommon. While the majority of investors see the expense of financing as a deterrent, property's perceived potential is edging out stocks and bonds. Among locations, the US residential real estate market is a top pick for investment. See the following article from Property Wire for more on this." It's not surprising as many are really worried about were to put their money. Especially after have about 10 years of saving disappear over the last few years. One thing about real estate is it's tangible, insured and worst comes to worst you can live in it. "Investors from Canada and the Gulf region were the most likely to increase their property allocations, with an average increase of 4% being put into real estate." 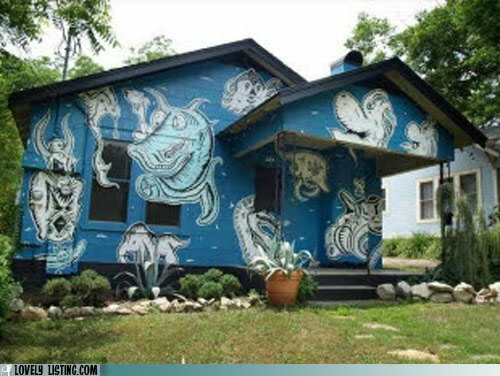 If you been on the MLS or looked at any home sales sites you know there are some pretty mediocre, bad and scary photos out there. Photos do sell the home. Most people skip listings without photos and by not posting great ones we could be pushing prospects away. The skills in this book are a must have if you do anything in real estate! 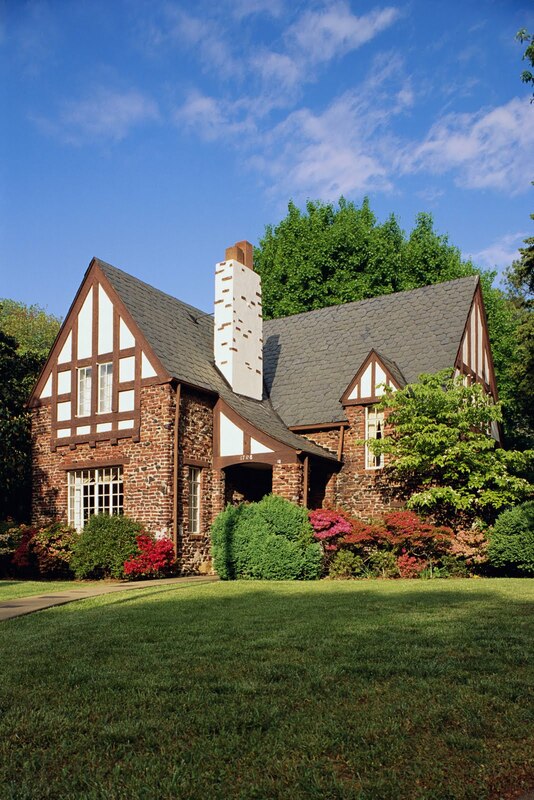 Discover how to take effective real estate photos. See lots of Do and Don't photos. Learn how to choose the right camera for you. 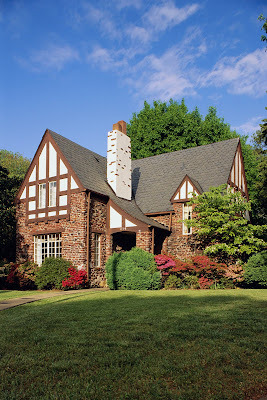 Find out how to compose real estate photos. Attract more viewers to your ads. Absolutely must know techniques for pros! Edmonton can now be toured online using Google Street View. "Edmonton and eight other cities have been added to the list of Canadian cities that were photographed Google's Street View feature." So you don't even have to leave your house to do a drive by to check out a property. Great for winter Check it out! How can you grow your money in real estate? Owning a quality property in a stable market with strong economic fundamentals is like having your own perpetual money machine. 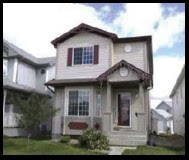 Attractive home near developing portion of the Anthony Henday ring road. When ring road is finished, accessibility to city center and oil refineries will be greatly increased, furthering profits. Well situated near schools, city transit and bike paths. Partner’s R.O.I is 146% - $100,000 profit to date. “If you would have invested in Case Study #1 in Edmonton September 1, 2005 by September 1st, 2009 you would have realized a $94,900 CAD profit (before taxes). Of course not all years are like this and that is why we are conservative in our estimates. We know that markets go up and down. We balance our investments to perform well in both up and down cycles allowing us to deliver consistent returns. Contact us for your Free Canadian Real Investor Report! I don't know if I can to be honest! I'm a tried and true winter-phobe. To the point that the crunch of walking on snow gives me the willies; much to my husband's dismay I drag my feet around like a cross-country skier. So even for me, a staunch Edmonton promoter, it's hard to embrace the winter. Whenever I hear "but it's so cold" I agree silently, however, I know money doesn't care where it's being made. I read this article and have to agree Edmonton should (insert I) embrace it's long, glorious, fantastic and long long winters. "Winter Light’s mission includes promotion and collaboration with Edmonton’s existing winter festivals, Deep Freeze; Ice on Whyte and Silver Skate Festival as well as new programming, Winter Light Welcome tents and special events will take place in the context of all three events." "I think winter has been one of Edmonton’s best kept secrets for too long," says Anthony. "Our goal is to showcase all the wonderful aspects of our winter city – the incredible recreation opportunities, the gorgeous river valley environment, and the culture and heritage of winter peoples." So instead of grumbling and running to our cars to avoid certain frostbite. Lets look around, smile and say, "It's the most wonderful time of the year!" I've never actually been to an Expo although having been in close proximity to 2 so far. The 1986 Vancouver one and the one in Aichi in Japan in 2005. The only thing I do know is that my friend got bit by a giant poisonous spider that smuggled it's way to Canada in a packing crate. She had a quarter size chunk missing out of her leg. On that note here is Edmonton's 2017 $2.3 Billion Expo Bid. Sounds fantastic! Hopefully I will take my 44 year old self and 9 year old son to it. - The fair would last 93 days from early June until early September. - The main site is on 25 hectares at University of Alberta’s South Campus, with pavilions from 80-100 countries, the 14 Canadian provinces, territories and federal governments, six companies, five non-governmental organizations, a recreation area and stages. - This area would feature symposiums and conferences as well as displays. - A “celebration” site is set for the historic west Rossdale-legislature grounds, which are slated for redevelopment, marking “places and spaces,” accessed by a new signature structure to replace the aging Walterdale Bridge and reusing the old Epcor power plant. - The water taxi between the two sites would also serve Fort Edmonton Park. - The budget includes $1.7 billion for construction, $386 million to operate the event, $55 million to subsidize poor countries that want to take part and $22 million for the entire bidding process. - Governments would pay $2 billion, with the remainder covered by admissions and corporate sponsorship. - Edmonton is the only Canadian city bidding for the event after Calgary backed out this fall; the 2017 host city will be chosen by the international Expo organization in 2012.
to this ? picture courtesy of It's lovely! I'll take it! Does snow make everything ok? Remember the first heavy snowfall of the year. You're out walking with warm mitten clad hands, toasty boots and a gut full of cocoa or perhaps a nice cognac for those so inclined. As you walk you can hear the crunch-crunch-crunch of snow underfoot. You look around everything appears clean and pretty. Even the broken down house on the corner looks better, the garbage in the yard hidden away by the cover of a dreamy blanket. If you live in B.C., it rains the next day and all the crud comes back up to the surface and looks twice as bad as it did before. Maybe the rain made it dirty, or maybe on some level you feel betrayed by the sudden and uncontrollable image shift. Either way it is just snow and a dirty yard. If my mom were out walking, which is pretty unlikely as she hates the cold, she'd just see snow and hate it for what it is. That's because she likes the hot South African sun and can't relate to our Canadian winters. But, it is all perspective. Especially in the current real estate and rental market. That brings me back round to that broken down house. If you want to sell it or rent it, you need to make it warm and inviting. Tidy it up until it shines and find a way to add value to it - for both the prospective tenant or buyer. There are a lot of listings on the market now and tenants have a pick of the best and challenge landlords to lower the rents - which many feel forced to do. When you look at that same paint peeling, rotten fenced, broken windowed home from an investors perspective - you can see opportunity. An opportunity to help a seller, and possibly a tenant, find a place to live in once you have done the needed repairs to turn that house into a home. I guess I answered my own question. Snow can make a dirty house clean and you can make a crappy house a home with the right attitude and ability to see what can be instead of what sometimes is. Get our investment free real estate newsletter - great tips on when, where and why to buy! The one thing you hear about rental property is "I don't want to deal with tenants!" Well it's not all black and white; for every 1 bad tenant you have there are dozens who love and treat your property as their own. However for that bad one there are many services which allow you the landlord to focus on more important things than getting a non-paying tenant out. Serv-it.ca offers bailiff, tenant default and process services. Basically they do everything that you don't want to. We provide a low cost, efficient service to ensure payment of rental arrears and/or eviction of problem tenants. One stop shopping - from the preparation and service of a Demand Letter to the enforcement of a Writ of Possession we handle the entire transaction. We offer a hassle-free way of managing tenancy issues and our advice is always free. There's gotta be a grocery store around here right? Famous last words. The house is perfect and matches all you criteria. You can' t wait to move but where is everything? How many times are you asked by a prospective buyer or tenant what amenities a neighbourhood (Canadian spelling!) has? A lot. I admit sometimes when I fill out online forms for our rental properties that I use my judgment on what is near and far. 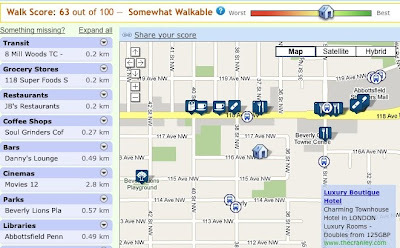 To Walk Score, this website is so cool! Simply put in an address and you will get a rating on the neighbourhood's "walk-ability"(whether you need a car or not) and the proximity of all amenities down to the last tenth of a kilometer. "Picture a walkable neighborhood. You lose weight each time you walk to the grocery store. You stumble home from last call without waiting for a cab. You spend less money on your car—or you don't own a car. When you shop, you support your local economy. You talk to your neighbors." Ah the last call dilemma.... haven't been bothered by that in years! Anyway it's an amazing resource for all real estate professionals. Alberta Spends $2Billon for largest Carbon Capture Pipeline in the world -"Alberta will spend $2 billion over the next 15 years to push through with the largest pipeline system in the world to capture carbon dioxide. The green signal for the project was the recent signing of Letters of Intent with the Alberta government by Shell and TransAlta Corporation. Once the two projects start in 2015, the yearly C02 reductions would be equivalent to tailpipe emissions of one million vehicles or removing off the road one-third of all the registered vehicles in Alberta." That is an incredible reduction of Carbon emissions! 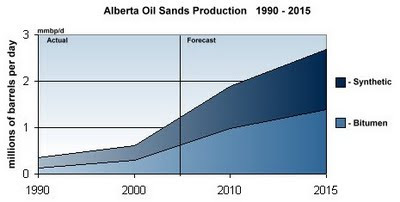 Alberta Productivity Lagging -"This is likely to be the first recovery led, not by North America or Europe, but by Asia, and it will be driven by energy and materials," said Leo de Bever, CEO of Alberta Investment Management Corp. (AIMCo). "Alberta will be right in the middle of it, but we have to do something about productivity." Alberta housing market stilll affordable but costs are rising: RBC Economics -"Although home affordability has deteriorated, it still compares favourably to long-term averages," said Robert Hogue, senior economist at RBC. "Activity in the housing market has picked up considerably in the province since last winter, with prices now stabilizing or even gaining in some areas." of the benchmark detached bungalow moved up to 34.4 per cent, the standard townhouse to 25.9 per cent, the standard condo to 22.4 per cent and the standard two-storey home to 37.9 per cent. "The market recovery has been less pronounced in Alberta than in other regions of Canada, largely reflecting the particularly tough economic conditions in the province," noted Hogue. "Nonetheless, still-reasonable affordability levels and an expected economic recovery next year should boost housing demand in the period ahead." In fact 35% affordability is very good other places, like B.C have seen figures in the 70% range. Oilsands players hiring again but the economy isn't quite back in the game - "But while the new jobs indicate that activity in the oilsands is picking up, Sumner said he expects Alberta's labour market to remain volatile. "It solidifies the fact that we know in the long run, these are viable projects and they're going to create a lot of jobs," he said. "Does this mean that it's a sign the broader economy is turning around? I'm not sure you can quite say that." Alberta's unemployment rate had jumped by 0.4% to 7.5% in October, an increase that had surprised many observers"
All eyes are looking to 2010 to be the year the economy rebounds, even with an unemployment rate of 7.5% Alberta was better off then most of Canada. Read this if you are worried about rising interest rates! We are all enjoying a reprieve from big mortgage payments but what how do we prepare for rising mortgage rates? There's been a lot of talk this past week about the inevitable rise in interest rates and its effect on the housing market. On the line with me is best selling author, Peter Kinch with Dominion Lending Centres. Pete, is the quick recovery and suddenly booming housing market setting us up for another fall? Well Russ, there's certainly that potential, but again we need to keep some perspective. Just a year ago everyone was worried about how much equity they lost and a year later the headlines show a double digit growth in prices. Clearly the housing market recovered faster than most expected. Do you think that was fuelled by the record low interest rates? Well absolutely, that's a major factor. I mean, the Bank of Canada accomplished exactly what it set out to do and that was to stimulate the economy and the housing industry represents a major component of that economy. So here's the question: if low rates spurred the recovery in the first place, could the inevitability of higher rates create a crash in the housing market 5 years from now when all these low rate mortgages come up for renewal? That's a very legitimate concern; but remember, the same people who lowered rates to stimulate the economy will be very careful not to undo their hard work by letting them rise too fast. Having said that, the prudent thing, for anyone getting a mortgage today, would be to budget for an increase of about 3% upon renewal. So my advice is to take advantage of these current low rates and increase your mortgage payments as much as your budget can afford. That way you will accelerate your debt reduction and when the day comes that you have to renew into a higher rate, you will do so with a lower principal balance. And that will help you keep your payments down. Thanks Pete, some good advice. In the Business Centre, I'm Russell Byth. The name "Edmonton" is a Latinized version of a Saxon word meaning "Happy Hamlet,” and was used to honour the home of HBC governor James Winter Lake who was from Edmonton, England. The city's population stands at 782,439 people as of April 2009; while Edmonton’s metropolitan population is more than a million people. Edmonton is the gateway to a land of majestic mountains, pristine lakes, historic rivers and northern adventures and northern industries of oil, gas, lumber and mining. Edmonton is located on the TransCanada Yellowhead Highway, a route that offers the easiest and most scenic drive across western Canada. The city of Edmonton began as a North West Company fur trading post in 1795. During the Klondike Gold Rush of 1897 prospectors and adventures travelled by rail to Edmonton and then began the long overland journey to the Yukon. Edmonton became the last supply centre on route. Edmonton is Alberta’s capital city. The Legislature is an iconic building of grand architecture where people flock to wade in or skate on the outdoor ponds. Edmonton’s Waste Management Centre of Excellence has one of the world’s highest standards in recycling, composting and minimizing landfill. The Clover Bar facility diverts 60per cent of its solid waste, the highest diversion rate across Canada. Edmonton won the 2009 Corporate Knights Sustainable Cities Ranking for the large city category. Some of you know that I 've lived in Japan for about a decade now. The one thing that is constant here is change. Sometimes if I don't go downtown for a month buildings have changed. Japan leads in new technology. The coolest thing is a square called a QR code that can go anywhere (clothing tags, drink cans, business cards) it acts like a bar code when scanned with a cell phone. The cell phone owner may be led to a website or can pay for the product using the code. "The listing-sheet box may be going the way of the $150,000 house. You know the box. It's affixed in front of homes for sale and holds brochures or sheets of paper with the property's asking price, listing details and the realtor's business card. It's being replaced, or superseded in importance, by a 21st-century- technology version that takes advantage of younger homebuyers' love of text messaging. Vancouver-based RealtyText is the latest text-messaging service to move into Edmonton. The company plans to move into Calgary as well. After launching in Edmonton two weeks ago, it now has more than 20 realtors subscribing to the service allowing them to upload their listings to the system and add a special code to their for-sale signs, says president George Haddad. Customers who see a home can punch the number on the sign into their phone. "All the information about the property comes up within seconds on their phone, including photos," Haddad says." Lots of good quick reads in your mid month update. Take a few moments to reflect on how businesses are using this downturn to set up labour contracts and align future projects. This is very similar to 2002 and around the Kyoto Accord time when the market was full of fear and FULL of deals. Although I think we're a ways off from a full recovery, you can clearly see the strength and backbone to Alberta's economy. Managing your current investments and and adding new ones at this time, will have you smiling in 2012 onwards as the economy begins to shine again. As you can see from the articles selected in your mid-month update, the big plans for Edmonton and Alberta continue. Many will wait until they see the economy in full recovery while the smart money continues to pick up the deals now. I appreciate all your calls and emails. I'm looking forward to helping you put together your next deal. "Meanwhile, according to ATB Financial economist Dan Sumner, the average Albertan spent more per capita on retail items since 2004 than people from any other province, yet in 2008 the average Albertan saved 13.7 per cent of disposable income, compared to a national average of 3.8 per cent. The reason for this discrepancy is that Albertans have had greater disposable income than people in other provinces, with high incomes and lower taxes. That will attract young people from Central Canada." You can expect population growth in Alberta to continue at a steady pace. The article goes on to state that real estate is not where people will be investing in the futue. I know that with a statement like the one above and all people generally needing a place to live - real estate will be the way to go for me. I invest in other things sure but as far as being able to control my own investments I want tangible real estate. The days of oil rigs pumping furiously are coming to an end. Unconventional sources of oil require more manpower to get the oil out of the ground. What does oil have to do with real estate? Imagine if your investment property was near the next big oil reserve, workers from around the world were going there to live and work for the next few decades. Tenants were willing to pay top rents because the economy was booming and they were making oil dollars. Alberta is that place, with vast oil sands that hold a proven 175 billion barrels of recoverable oil, second only to Saudi Arabia. The most impressive part is that Alberta has only just begun; experts say oil sands production can be sustained for at least 400 years. Think of the long-term, not an economy that in coming out of a recession but as the world starts to recover and the demand for oil increases - rents, property values will again increase. Maybe not like 2007 in Alberta but steady consistent growth that makes investors happy. This news made my day and probably the day of every single expat living in Japan. 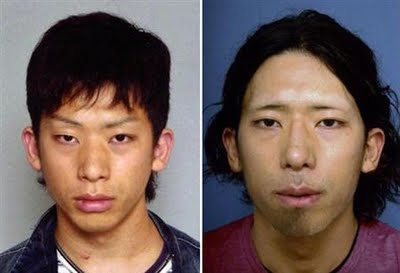 The prime suspect in the murder of Lindsay Hawker, Tatsuya Ichihashi, has been caught at a ferry terminal in Osaka Japan. It was an insult to her, her family and the shame of Japan that this guy escaped barefoot in a foot chase in 2007 . His ludicrous "getaway" was made in front of a slew of police officers who were investigating the apartment where her body was found. The fact that he lost his backpack with all his money and clothes while escaping but was able to remain in hiding for 2 years is unbelievable. I am so happy for her family that perhaps finally closure can come to them. I was reading Dr. Demartini's Count Your Blessings. It's a really good self-help book for being appreciative of what you have even the bad things. Once you can do this you'll notice your health getting better. For example the man with crippling arthritis never being willing to "stand" or "bend" to his employer's will. Does mental health affect physical health? You bet. Anyway I'm getting off-track. I wanted to share the free digital radio station listed on the back of the book. HayHouseRadio.com is free for anyone. It's inspirational talk radio featuring top Hay House authors (like Dr. Demartini). Some programs where a little much for me - I still don't believe in crystals but I found other programs very uplifting. How to keep investment real estate profitable in any economy.